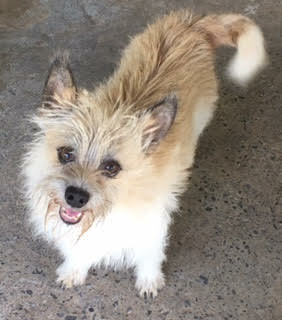 Meet Louie, our sweet and scruffy #VSCares sponsored pet for Quarter 3 of 2017. As part of our support for the local animal rescue community, VSC has sponsored some of Louie's medical care fees so he can receive necessary treatment. Despite a rough early life, Louie was a sweetheart from the start. He was an owner surrender and was brought in with several other dogs. They had been living in an outdoor pen, and had never received any veterinary care. They also weren't always fed appropriately. The first couple days after being surrendered, they were passing large amounts of corn in their stool. After extensive testing, it was determined that Louie has severe scleroisis of the liver. Sadly, while he is somewhat stable, his values have not improved much. Thankfully, he is comfortable and safe living with a long-term foster and on long-term medications. Wishing this little guy many more happy days of playing, treats, and belly rubs! Please note: Given his medical condition, Louie is not currently available for adoption. Thank you to the many wonderful animal rescues and shelters and animal welfare organizations in the Northern Virginia-Washington, DC region for all the work you do! Stay tuned: Our next VSCares Sponsored Pet will be announced in December! Have a homeless/in-need pet to suggest? Email marketing@vscvets.com.